Come on, thats is the opposite what I said. I said the worst that can happen if you are diligent, (opposite of negligent) is that you have to replace the water pump or some hose. The worst that can happen when you precautionarily replace something is to find it was something else. The logic is right in front of you and not so easily dismissed. Talking 5.0l engines: Is there actually an XK out there that doesn’t have a slight smell of coolant in the engine bay? Because earlier this year when I was looking at various XKs and XKRs from 2006-2014 there was not one XK that didn’t have this smell. Not XKRs however - the two of them that I had a closer look at didn’t. Coincidence maybe or a result of a somewhat less plasticy cooling system of the XKR. My '10 XKR smells of coolant, especially when the ambient temperature is hot. It had the water pump changed around 8 months ago and doesn't seem to lose any coolant. It has also been pressure tested and passed so I am just living with it for now but keep a close eye on the coolant temperature with my OBD gear when I go drag racing. Ter11, I have the same symptoms as you, slow coolant loss and smell of coolant/antifreeze after a drive. No sign of coolant on the garage floor and a friend looked at the pump for me and declared it to be a new one (I've only had the car two months so far) so I guess it's not that. Suspect it's something that only "leaks" once it's properly heated up, i.e. short trips or pressure testing when the engine is not up to operating temp may not show it, or not enough to be detected. Right now I'm taking the Q&C approach as detailed above, watching the coolant level every couple of days or so and paying attention to the car for noises, smoke, smells etc. Next time it's in the garage I'll have them check it out. A few things to keep in mind is to check the fluid level both cold and hot. When cold fluid should be at the MIN line and at hot no higher then the MAX line. Also either have your pressure cap check or replaced. They don't last forever anymore. If you have the energy and someplace to do it (on a lift) then take the time to remove the belly pans and do a search. Also after a hot run when you stop just pop the bonnet and look around the pressure tank. Every Jag I've ever had smells like coolant from time to time. It's a tie as I've never had one that smelled like coolant. From experience with other cars in the past and also going trough the coolant loss check list of the workshop manual: slow coolant loss may also be caused by very small cracks in the engine block. In fact in our family we had a car many years ago where the engine was replaced under manufacturer warranty because of slow coolant loss that was diagnosed due to a small engine block crack. However that particular engine model was known to have these issues. 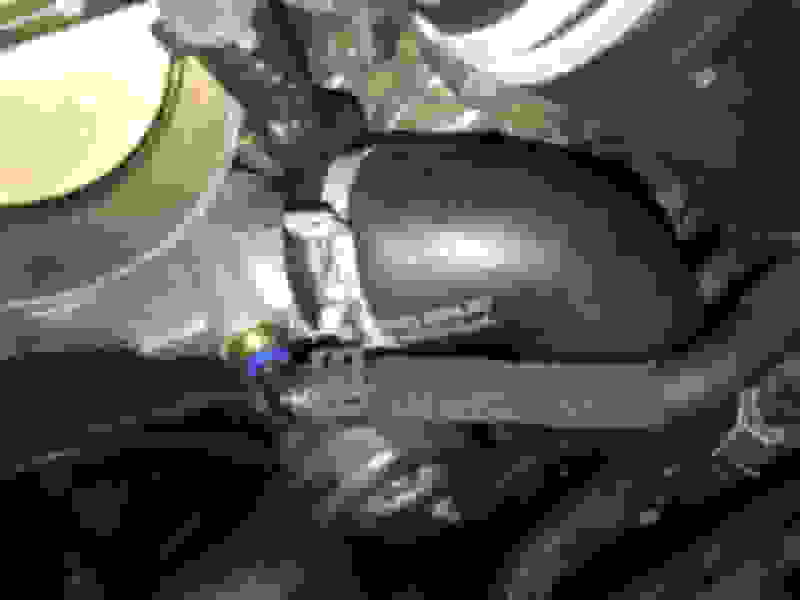 For the x150 I never found reports about such trouble with engine block developing cracks. Anyone else did? my 2010 XKR is on pump #3 now & they also found a crack in a hose somewhere on the bottom of the car. I’ve put about 5k miles on with no coolant smell. Even after pump #2 I had the faint smell so the hose was probably leaking the entire time. It’s nice to finally not have that smell. I only hope it lasts! just in case you are eventually again at the workshop, I would certainly be interested about the details which pipe it was. Many thanks!! I don't know that it was due to cracks or just manufacturing tolerances, but General Motors up through at least the mid-90s made it standard operating procedure to add two AC Delco Seal Tabs to the cooling system of every new car coming off the assembly line here. That would plug up anything that was no bigger than a hairline crack and keep customers from bringing the cars back while under warranty. I have not read any stories on here about cracks in the Jaguar engine blocks, but lots of stories on this forum about cracks in all the various PA66 nylon cooling system components. As the material ages, it can get crispy. Having just completed a coolant pump change in my 2010 XKR, the latest revision I found was AJ813909. After a couple hours research looking for the hard (brittle) tube (B in graphic) and the little Y shaped part number (A in graphic) connecting the pump bypass and the throttle body to the heater return, I realized the design had been changed to a simpler and more reliable configuration. The Y part is no longer available, nor is the hard tube. They are replaced by a new design that has a thick rubber tube coming off the large coolant tube (C in graphic) thermostat to upper manifold. As my car is a daily driver who has put about 60k of the 120k miles on my XKR, I try to minimize unecessary downtime. As I do my almost all of my own mechanical work, I would definitely recommend at a minimum changing those parts (for about $100 US) and save yourself the extra hours of labor that will be needed when they deteriorate from the inside out simply due to age. The new design requires replacement of the large coolant tube and the Y part, but eliminates the brittle plastic tube, and you get a new plastic bleeder connection to plug into the coolant pump, which is another common failure point that will cause you to have to go to the new design. Would you know if the hose setup is identical for the 2010 XK non super charged 5.0 as in your 2010 XKR? ... told me pressure test showed no leaks. A few decades ago I had a Vauxhall Cavalier as a company car andI noticed the coolant needed topping up every 1,000 miles (I was doing 36.000 a year so it was quite frequent!). The servicing dealer gave it a pressure test which showed no issues, but then the mechanic had a poke around under the engine and a hose popped off - its jubilee clip hadn't been tightened in the factory! So the pressure test isn't infallible, IME. It's not. 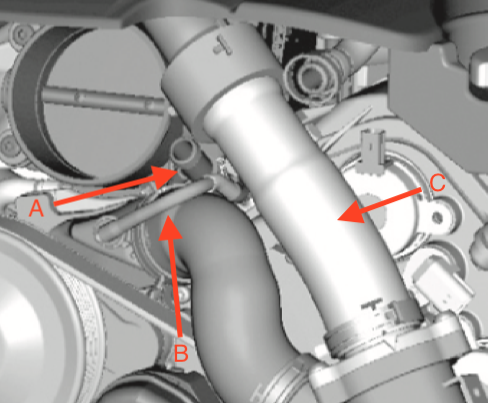 The large coolant tube "C" is shorter in the non-supercharged by about an inch. The diameter is slightly smaller too. Last edited by riverman; 02-10-2019 at 02:34 PM. Thank you. It figures I’ll have to keep using plastic parts. Riduculous! 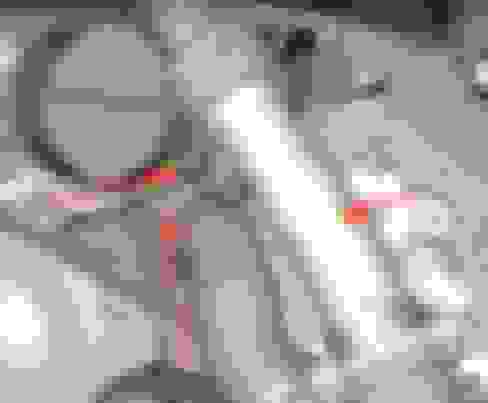 Last edited by bocatrip; 02-10-2019 at 03:25 PM. Or... I purposely slightly overfill the reservoir, hoping after running the right amount gets corrected through expansion/contraction. Obviously there is a short period of odor. A habit from older cars. Smell is never on inside of car. Always on outside after a drive. That should eliminate the heater core. After so many inspections and pressure tests there has never been a single sign of any crusty coolant anywhere. Of course in reality it only takes a few tiny drops of coolant to cause the smell. If the culprit can’t be found it can’t be repaired. Have you tried changing the expansion tank cap?